Nurse are being urged to help raise public awareness about pressure ulcers by wearing a red dot on their uniforms throughout winter. Other NHS staff are also being asked to wear the red stickers and badges to encourage conversations about the prevention of pressure ulcers in hospital, care settings and in patients' homes. The campaign was launched today by NHS Improvement (NHSI) as part of International Stop Pressure Ulcers Day. It aims to raise awareness about the common avoidable injuries to skin and tissue which mainly affect people who are confined to a bed, chair or wheelchair. 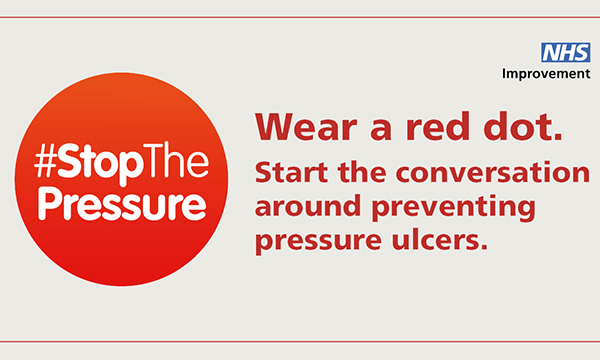 The initiative is an expansion of the Stop the Pressure programme, a campaign about early warning signs of ulceration which saw a 50% reduction in pressure ulcers in the NHS Midlands and East Region in the year after its launch in 2016. However, the latest data from the NHS Safety Thermometer shows 1,300 new pressure ulcers are still reported each month, while treating pressure ulcers costs the NHS more than £1.4 million every day. Supporters can display a red dot on their social media profile as a symbol of awareness and support and use the hashtags #StopThePressure and #StopThePressureDay. NHSI has also sent out stickers and badges to nursing teams in trusts across the country.